When it comes to using a rangefinder, the question still lingers on. How useful is it? Is it necessary? If you use a rifle or a bow to hunt, you know how much accuracy means to you. The precision of a target gives you the advantage of taking a one kill shot. No messy wounding of animals, no tracking for long distances and you even save yourself the need to get too close to an animal. 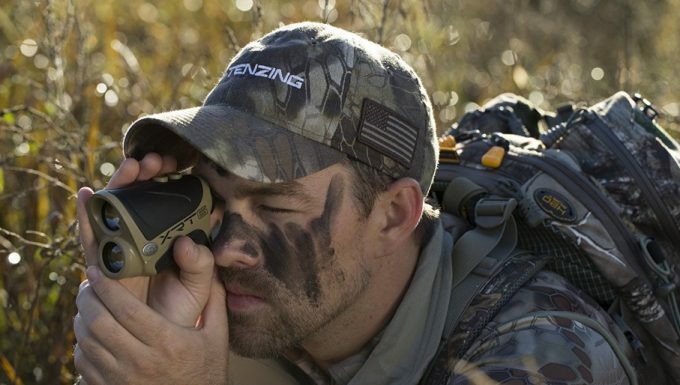 Laser rangefinders are the best thing that happened to the hunting and golf sports. They provide the accuracy of the user up to 100% that is if you know how to use one properly. The beauty of rangefinders comes in their capacity to give the precise position of a target whether in long range or close range shooting. It uses a beam which bounces off to the target and back to the hunter in seconds. The distance it takes to transmit the beam to the target is then calculated using a clock on the rangefinder and is displayed on a small screen. Rangefinders are small tools which are most likely pocket sized. Each rangefinder has some essential features while others carry advanced features. Because of this, you’ll find the price varies immensely. Some come with a price as low as under $100 while others kick it up a notch bearing a price over $1000. 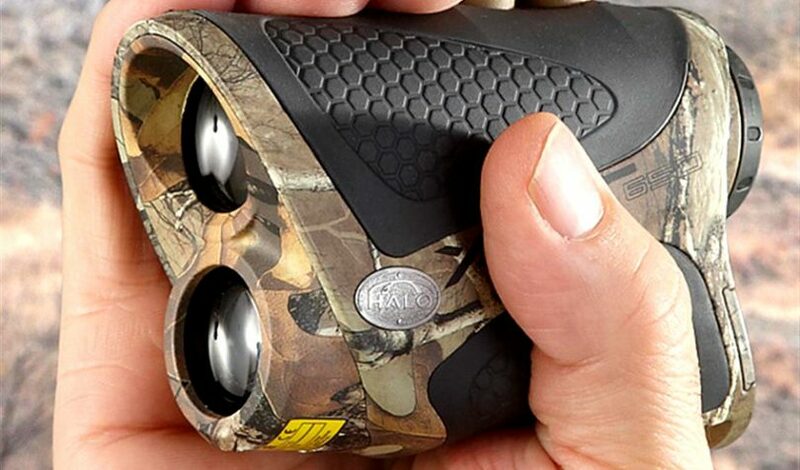 We look at the Halo XRT Laser Rangefinder. It is a lightweight unit for those who like to travel with few tools for hunting or golfing. Halo Optics Company has not been around for long but is sure to bring very competitive products like this model. 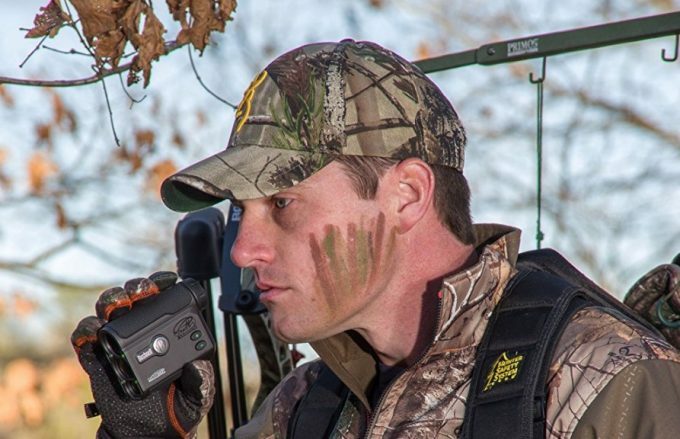 This rangefinder comes highly recommended by hunters and golfers alike. Mostly because of the 6xmagnification, it gives wide area coverage while staying close to the target. The housing, compact design and lens system all work together to provide the user an easy time while out in the field. From the exterior, it is not one of those brightly colored rangefinders. It has a camo and black finish meaning it is beneficial when you want to hunt and hide your position at the same time. You can venture out on random surroundings since it can easily blend in with the vegetation. This device does not come with the CR2 battery it uses. Lithium-Ion batteries are considered a transport hazard; hence you’ll be required to supply your unit with one. This unit is built to sustain constant use. It has a water-resistant rubber exterior. If you happened to drop the tool on rough terrain, the rubber acts as a shock absorber protecting the inner elements from damage. This way, the rangefinder is set to be in good condition for a long time coming. The rangefinder is nitrogen purged as many users have come to like the lens stay free of fogging. It is also ergonomically designed with contoured edges which fit the hand to provide a firm grip in all weather conditions. Not to mention, the rangefinder’s finish is also responsible for preventing reflection of light against the surface. As such it can gather light in poorly lit environments with ease. You’ll love that along with the camo and black exterior you’ll not call for attention to your position when in dangerous situations. It also has a rugged feel which keeps it protected from abrasion and scratching. Looking at the small and hand-sized unit, you’ll be surprised that it feels robust and sturdy. It is not easy to drop as it weighs around 10ounces, so it will always be in your hand. Besides, it is designed for use with either hand without fumbling or losing your grip when doing the interchange. You can also install a tether to use when you want to target and shoot immediately after looking through the rangefinder. This tool sees a user-friendly vertical style with two buttons. One of the buttons switches the unit ON and helps in ranging. The other changes the readings from meters to yards and vice versa. After you change the metrics the first time, you are okay with just using one button so we can safely say it becomes a one button rangefinder. The buttons are intuitively placed at your reach whenever you need to use them in an instant. The Halo XRT 650 yard does not come with the battery. This is a small price you have to pay considering it uses CR2 Lithium-Ion battery. This type of battery is better than regular 3V and 9V batteries. It can conserve energy for long since it does not self-discharge. One reminder though is always to uninstall the batteries when storing the unit. This procedure keeps the battery from damaging some inner parts in case it leaks. With this rangefinder, you get to use it in various temperatures since the battery is in a well-designed compartment. It can maintain the proper working environment for the cell such that if you are in extreme outdoor weather, the rangefinder will still be useful. You’ll also like that because it conserves energy, you’ll not keep checking the battery level. It powers off automatically after 20seconds of not touching the button, so you should not worry about the battery draining when it’s not in use. To positively identify your target range, you need to constantly have readings which cover other elements in the line of sight. This includes trees, bushes, and other animals. For you to know exactly when to take the shot, this rangefinder has its exclusive scan mode. It gives the readings continually for you to be able to take a shot along one of the provided measurements. This mode is most convenient when you are tracking a fast moving animal like deer. It updates the readings after you pass each stationary target, so you’ll not shoot at landmarks. Although there have been complaints of the updates delaying over 15seconds before scanning, you’ll still be able to span different terrain. The Halo XRT can range out to 650 yards to a reflective target. This indicates its performance in perfect conditions. However, when in action, its distance capacity for soft targets is at 300 yards. This is impressive seeing that for it to range out correctly this far, it must use very powerful optics. With an accuracy of+/-1, you can be sure to bring the buck home. It has its readings in a bright display which is a must for long range shooting. You don’t want to fumble with a torch when figuring out the distance measurements. When it comes to focusing, it allows twisting of the eyecup with one hand as you use the other to hold against your eye. The good thing is that with the contoured exterior, you can maintain a firm grip as you sight in. 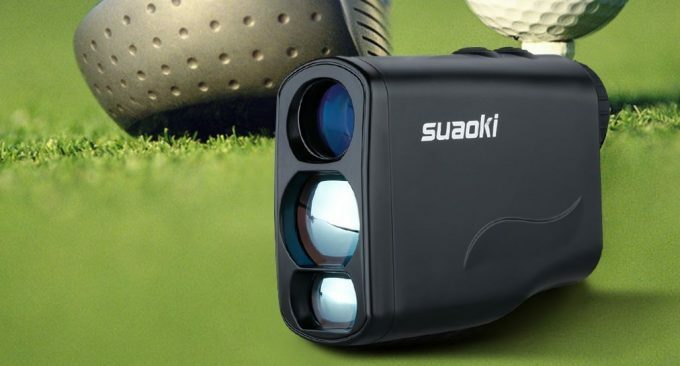 This rangefinder boasts multicoated 6x optics. It offers a superior field of view to ensure you are aiming at the correct target. The clear lenses are a must if you are going to be in dim surroundings. It can retain most of the light that comes through its 23mm objective lens. This way you can hunt in confidence when taking unpredictable close shots. The optics have a generous eye relief, making it attractive to persons who wear glasses. As you scan the environment, you’ll also get stable, sharp images. 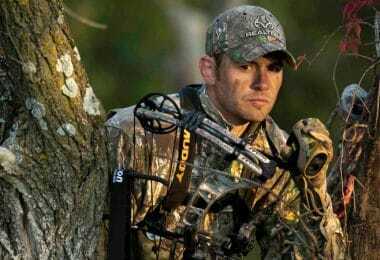 Its high-end optic specifications allow for better scanning of the environment behind you so that you can spot prey camouflaged by trees and shrubs. Working with this rangefinder opens up a wide LCD where you can zoom the readings in or out. Although it is not backlit, you’ll be able to see the measurements clearly in most conditions. You’ll like that the numbers are always easy to make out since they are crisp and sharp. 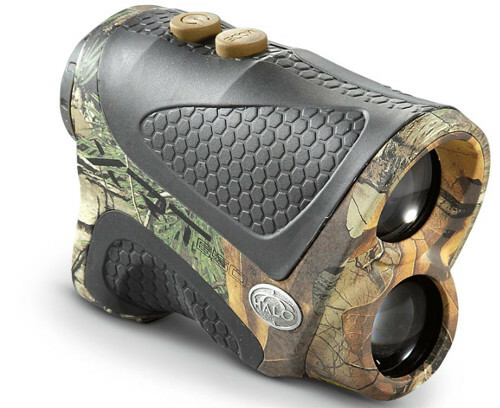 This rangefinder features distinct functions to ensure a successful hunting. From the simple button operation to accurate readings, the manufacturer prices it quite reasonably for around $120. And this offer does not stop there. You get a warranty card along with the purchase which guarantees the product for one year. Also, all repairs concerning workmanship are free for the first year. Halo Optics also ships for free all replacements. Restrictions to free repairs are on all defects caused on the side of the buyer. This includes having another person fix the unit or natural wear of the product. Now that we have gone over our main rangefinder we’ll take a look at some other offers that are close to it. This will let you see the range of what is out on the market today and see if something similar might be a better choice for you. Leupold has a reputation of making competing products at very affordable prices. 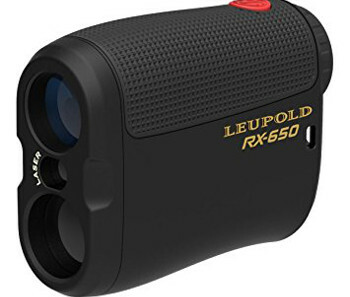 Like the model above, you can also buy the Micro Laser RX-650 Rangefinder from Leupold on a budget for approx. $170. 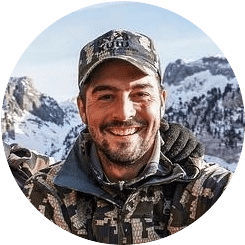 Its ranging power is higher than the Halo XRT, being able to range 650 yards on reflective targets, and for trees at 600 yards while it can reach 575 yards on deer. To say the least, this is the real definition of a long range laser rangefinder. It also has an accuracy of +/-1 yards or meters. Like Halo XRT, it is equipped with the scan mode as its primary targeting mode. It does not carry angle compensation or provide for target priority. Nevertheless, this device enjoys a clutter-free black display. You’ll tell the correct estimate of a target even when stalking fast-moving animals. What’s more, the scan mode is faster than the Halo XRT since you only need to press down the button and it starts to update markings continuously. The display is also furnished with a battery level indicator to keep you updated on battery usage. This way, you’ll never be caught with a low battery. Speaking of the battery, the Leupold Micro Laser Rangefinder uses two CR2 batteries. They keep the unit running for extended hours. The battery compartment is a bit tricky to open in the field since you have to unscrew it. Nevertheless, it is easy to operate with an adjustable eyepiece which helps to focus the reticle. Its 6x magnification is excellent for close range shooting while providing a comprehensive view of the background. The housing of this unit keeps it afloat among other rangefinders. It is entirely weatherproofed against water, fog dust and debris. It has a rubber housing which not only provides a firm grip but also acts as a shock absorber. You’ll like it even more since with rubber you’ll not experience unintentional clanking which may scare away animals. 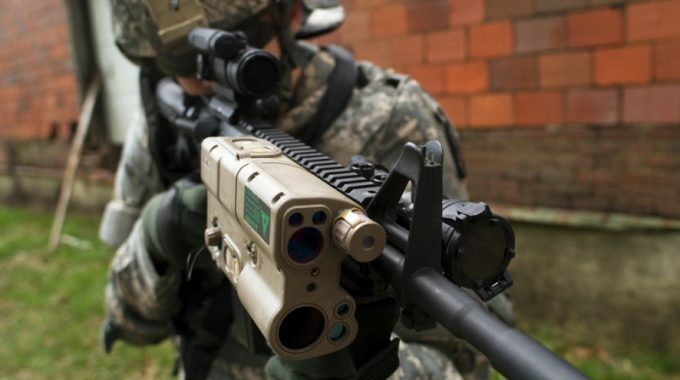 This device is beneficial in hunting, shooting sports, law enforcement, military and wildlife watching. This tool is in a class of its own, offering both scan mode and Angle Intelligence Technology (AIT). 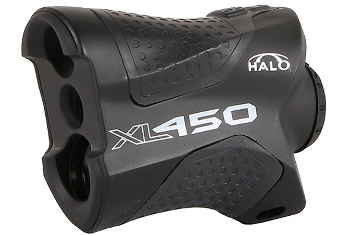 The XL450 Laser Rangefinder, offered by Halo, can cover a long and wide distance out to 450 yards. You can use both methods to determine the distance of the target wherein scan mode it takes readings consecutively. The AIT is useful when you want the numbers to display the compensated reading of the slopes. It achieves a +/1- accuracy in either mode. With an inbuilt LCD, you’ll be able to read the markings in either yards or meters. It also has indications of the battery level in this display. Like the XRT, it carries 6x magnification and bright optics for sharp images. You can use either unit in hunting, but the XL450 benefits bow hunters more. It can also be of great use in golfing since in the scan mode; it becomes easy to locate the flag. The Halo XL450 has curved sides furnished with rubber. It, therefore, provides a tight grip while remaining compact in hand. It seals from moisture and other outdoor elements like dust and fog; hence very attractive in unpredictable weather. The lenses are multicoated to protect it against any reflective light. It emphasizes on clear shots thanks to the adjustable eyepiece for fast sighting in of the reticle. All these features come at a very inexpensive price of approx. $90 which is a total steal. 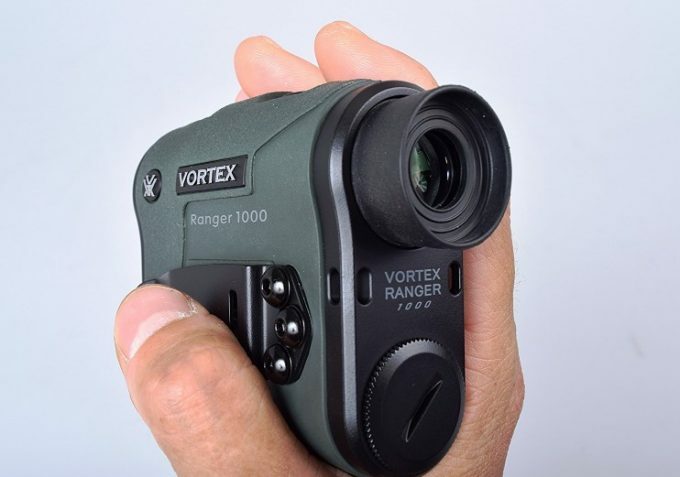 This is another genuine rangefinder priced in the same range with the Halo XRT at approx. $120. 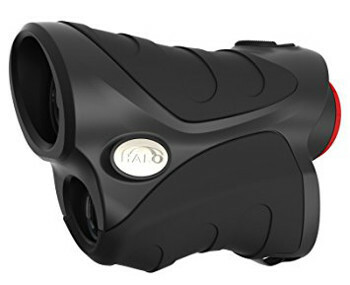 You should expect the X Ray Z6X Laser Rangefinder from Halo to perform much like the XRT since it is also small with a rugged exterior. It holds up to the weather as the rubber finish gives it this advantage. It provides all users the well-deserved grip in wet conditions and when in gloves. It also benefits from the scan mode for constant ranging. It activates fast with the touch of a button. If you want to take precise kill shots, this mode makes it possible by producing constant readings on the move. The only thing though is that it does not give readings after the decimal point so you may find it hard to aim if you need that extra precision. This drawback does not always mean a bad thing since you learn to make correct estimations using the provided numbers. As such, you’ll always be ready for unpredictable circumstances. 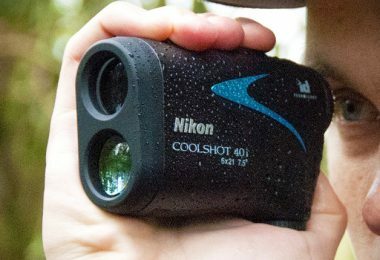 Another unique aspect of this rangefinder is the angle indication technology which helps compensate for slopes when ranging. It has one button, making it easy to switch between the modes. It comes with a nylon carrying case for further protection. This unit is best for hunting using a bow or rifle and is also at home when used for golfing. Compared to the Halo XRT, the two models have comparable features except for the AIT mode in the Halo X Ray. If you want the readings to account for sloping, the Halo X Ray is a better choice than the Halo XRT. Halo Optics supplies this competitively priced rangefinder. It is a sturdy unit with non-slip housing. It is pocket-sized giving avid hunters the chance to range and shoot almost instantly as it is easy to put away and take a shot. It lives up to the standard of highly ranked rangefinders seeing that it carries advanced features like the constant ranging scan mode. 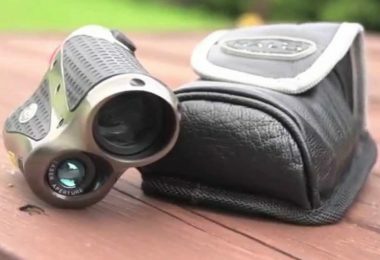 Hunters and golfers gravitate towards this device mainly because of the magnification. The full field of view, long eye relief, multicoated optics and bright display makes for a very reliable rangefinder. It achieves excellent accuracy from 650 yards on a reflective target and 300 yards on big game. As it is nitrogen purged housing to prevent any form of moisture; hence dependable when the weather turns in the open outdoor fields. The battery life is another important aspect of this device. With a CR2 battery, it is expected to run for over many months without replacing them. The display provides precise readings in various conditions which make it possible for hunters to be out longer or rise early in pursuit of their favorite sport. The camo finish gives it a first hold for hunter and sports shooters who want to mask their position in plain sight. In a nutshell, this is a well-constructed unit with the user in mind. For an authentic rangefinder which ranks at the top, we can say this is a remarkable pick. Expect to blend with the gritty outdoors as its strong appeal lends it to the extreme terrain and adrenaline pumped excursions. The rainproof shell plus the compact size makes it extremely portable. It suits active hunters who like being out pursuing their prey while making one-time kill shots. After going through the above features, it’s clear on what to expect from a decent rangefinder. Every model provides enticing features. We hope you can now decide on what you want and make the best choice. In this industry, the price indicates exactly what you get. The above rangefinder offers only the essential features which give it the low-end pricing. The Halo XRT rangefinder may lack in some advanced features, but it has high-quality optics and excellent lens system. The scan mode being the signature feature combines with state-of-the-art technology to provide accurate readings each time. If you want to experience the perks that come with using a rangefinder without breaking the bank, you have the Halo XRT. Have you had the chance to work with any of the models above? Please let us know of your experience in the comments section.